Confetti Cannons are always a popular choice for awards ceremonies. With everyone dressed up, an air of excitement and lots to celebrate, confetti compliments the moment perfectly. Vue Cinemas staged their annual awards ceremony at The Intercontinental, Park Lane recently. 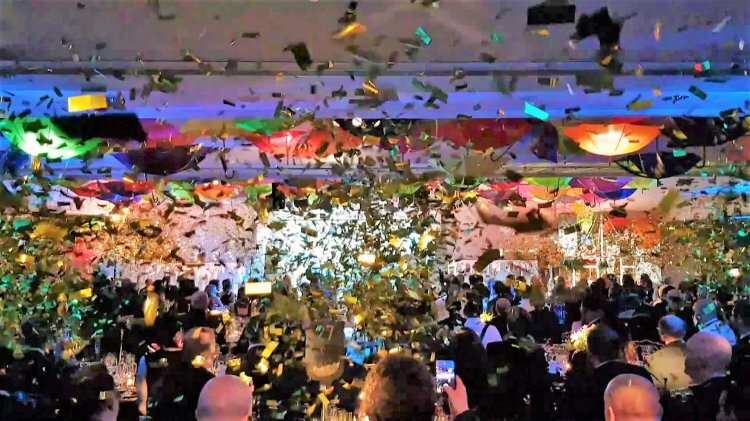 With a stunning set themed on Mary Poppins; umbrellas cascaded from the ceiling, Admiral Boom and his trusty cannon, dancing chimney sweeps and Claudia Winkleman hosting, the stage was set for a fabulous evening’s entertainment. Confetti Magic provided theatrical flash pots to simulate the cannon firing. The dazzling flash and puff of smoke was combined with sound and lighting effects to complete the illusion. We used our wireless Firestorm firing system to reliably trigger the effect on cue. When it came to the grand finale, the cannon prop was to fire a shot of gold confetti that was immediately followed by a shot over the room to cover the whole audience. The ceiling height was not high enough to floor mount the confetti cannons and the truss was covered in umbrellas, so we mounted them on vertical supports around the room and angled the barrels parallel to the ceiling. Using twelve Powershot cannons loaded with large gold cartridges, we triggered the shot using a combination of wired and wireless DMX switch packs, bringing the star-studded evening to a glittering close.